17/01/2011 - One of Cycling Southland's most generous supporters passed away last week and Ken Baxter was suitably farewelled today in Invercargill. A large crowd gathered to pay tribute to one of Invercargill's real characters. In recent years Ken was one of the most familiar faces at the ILT Velodrome and at his memorial service, Cycling Southland Life Member Graham Sycamore regailed stories of Ken's years of service to the sport as a rider, a fan and a financial supporter. Ken's incredible personal generosity gave great momentum to the Velodrome build project. He wanted no fanfare around his personal contribution and took considerable prompting before he allowed his name to go up on the Sponsors Board at the facility. He was also to be found in one place during the building of the ILT Velodrome - alongside designer Ralph Schurmann assisting where he could with a hammer or broom in hand. Schurmann took a photo of Ken and some of his fellow "experienced" labourers and sent it home to Germany showing his friends back home the type of labourers, Invercargill was providing for the project (tongue-in-cheek). Schurmann has built velodromes the world over, but the support from Ken and co moved him to place the building of the ILT Velodrome at the top of his list of favourites. Already, he has been missed. Cycling Southland's recent ILT New Year Carnival was notable for Ken's seat being left vacant. The crowd, riders and officials stood as one in silence to remember the man and all he has given to our sport and organisation. Ken bought this bike new in the 1930s. It is a Reliance Special built by the Hills Brothers in New Zealand. 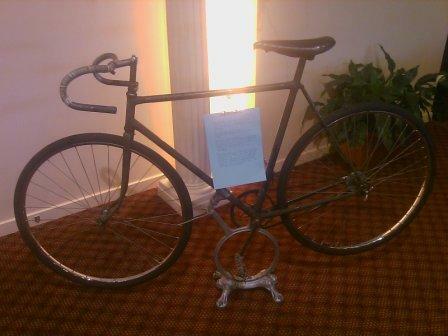 In 1939, Ken won the Gore to Invercargill Road Classic on this bike. Everyone rode wooden rims at the time but Ken wasn't a big fan of them and switched to steel after his rear wooden rim blew apart while waiting in the sun for a race at Tuatapere. Ken rode this bike right up until the early 1990s.